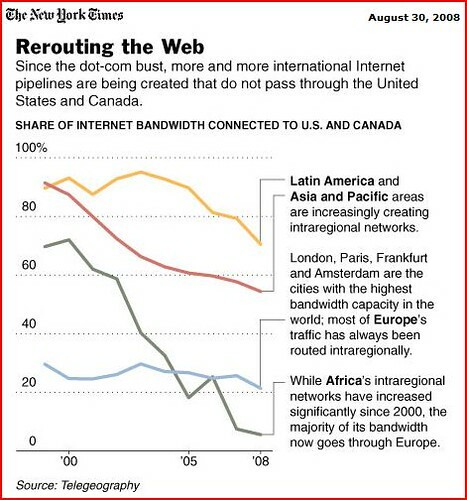 John Markoff had an interesting article in the New York Times this weekend entitled "Internet Traffic Begins to Bypass the U.S.." In the piece, Markoff notes that "The era of the American Internet is ending" since "data is increasingly flowing around the United States," instead of all flowing though our country, as it once did. Markoff focuses on how that "may have intelligence -- and conceivably military -- consequences." Indeed, it may. But what I also found interesting about this fact is the implications it will have for the future of content regulation. As Harvard's Yochai Benkler told the Times, "This is one of many dimensions on which we'll have to adjust to a reduction in American ability to dictate terms of core interests of ours." Content controls are one way that lawmakers enforce what they perceive to be a country's "core interests." As less and less Internet traffic flows through the U.S., it could become increasingly difficult for American lawmakers to impose their particular vision or morality on the Internet. And that's both good and bad news. That's good news when we consider the ways in which American lawmakers might look to restrict online speech and commerce. For example: regulation of speech on social networking sites, or efforts to regulate online gambling. Our lawmakers shouldn't be regulating those things, and as more traffic moves offshore, it might make it more difficult for them to do so. I discussed this point at greater length in my essay about the book I never finished: "The End of Censorship: The Future of Content Controls in a World of Media Convergence." But that is also bad news in the sense that, relatively speaking, the United States is a stronger defender of online free speech and commerce than most other countries on this planet. As more and more Net traffic begins to flow through other countries and continents, it may become more somewhat easier for repressive states to exert undue influence over the Web. Then again, it may be the case that the game of regulatory whack-a-mole just becomes more challenging for those countries as well even as a greater percentage of traffic flows across their borders. What do you think? Will less Net traffic flowing through the U.S. hurt or help the cause of online free speech and global commerce?